Lalita Kamble, 50, is photographed in the doorway of her home with her niece. 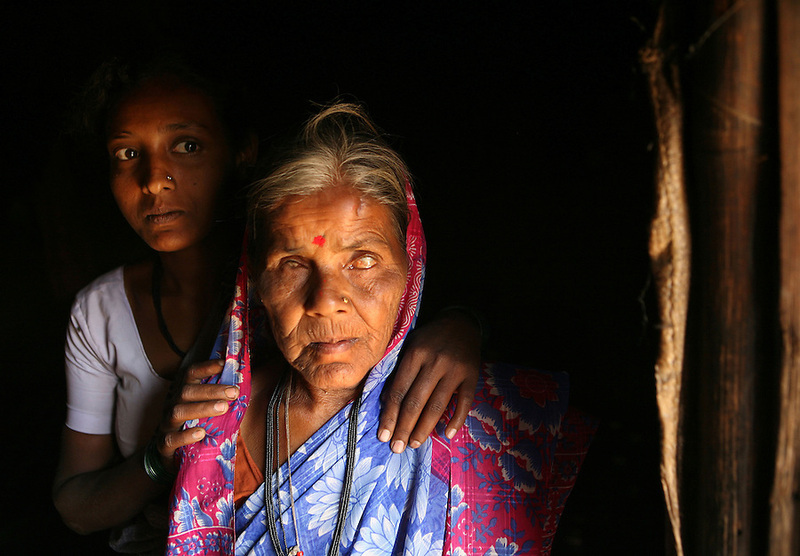 Kamble went blind at a young age and so, when she was eight years old, her parents dedicated her as a Devadasi. "They said you can be buried as a married person now because you're married to Yellamma," she says, referring to the ritual of burying unmarried women in a lying down position while married women are buried sitting up. "I wished I could get married but I knew no man would marry because because of my blindness," she adds. Through a dairy program set up by an organization called Vimochana Sangha which was founded to dismantle the Devadasi system, Kamble now takes care of a water buffalo and makes some income from the sale of its milk. Despite her acceptance of her lot in life, she does not support the continuation of the Devadasi system.